BE THE CHANGE, ORDER NOW! 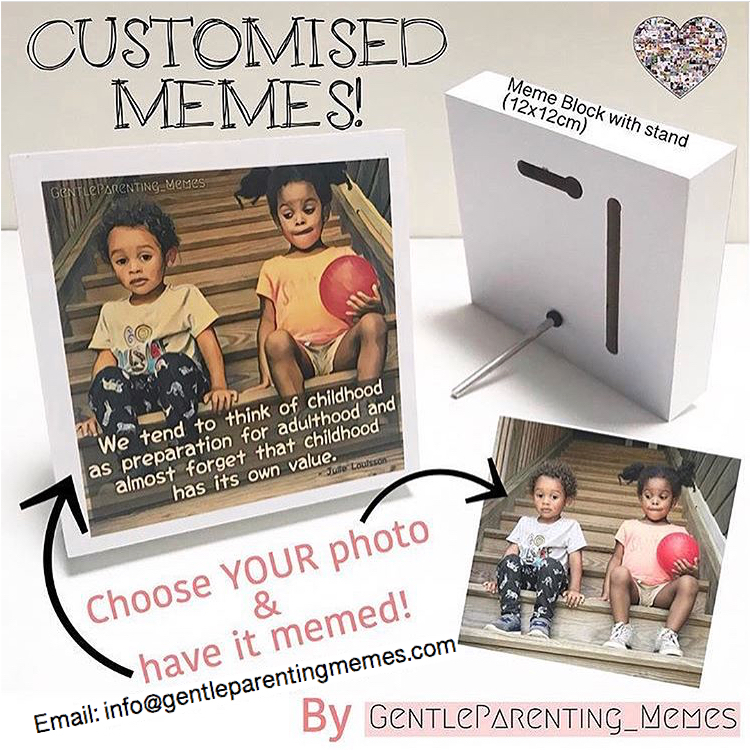 To place an order or to enquire about Customised Memes and Gift Vouchers, please email us at info@gentleparentingmemes.com. Register to be informed on anything new at Gentle Parenting Memes. Gentle parenting supports a positive, respectful and peaceful approach to communicating with and guiding children. It aims to help children have a healthier, happier future and nurtures a strong bond between parent and child. A meme (pronounced: meem) is an activity, concept, catchphrase or piece of media which spreads, from person to person via the Internet. Often humorous, however in this case, inspirational. Kirsty Lee shares Gentle Parenting Memes on her two social media accounts, on Facebook and Instagram, (but are also frequently shared on Pinterest, Twitter and many more virtual online networks) to support those who wish to take this approach with babies and children. 3WHERE DO YOU SOURCE YOUR QUOTES AND PHOTOS FROM? Quotes are mostly by authors and parenting coaches, and some are by parents or bloggers, all who align with and advocate for, gentle parenting, and treating children/humans respectfully. Photos come from all around the world, accessed through social media- mostly Instagram. Permission has been granted to use all copyrighted material and photographs owned by other individuals. 4WHAT TOPICS ARE COVERED IN VOLUME 1 OF GENTLE PARENTING MEMES? 5WHAT IS THE SIZE OF THE BOOK? Gentle Parenting Memes, Vol 1, is 12 x 12 centimetres (4.7 x 4.7 inches) and 84 pages of pure positivity and inspiration. It's the perfect size for your bedside table or to put in your bag and take to your friend who needs some support. It's also lightweight and economical to ship worldwide, making it available to more people! 6THE BOOK IS MADE IN AUSTRALIA, WHAT IS THE INTERNATIONAL PRICING OF THE BOOK? Please refer to exchange rates for the current conversions, at www.xe.com. 8HOW LONG DOES SHIPPING TAKE? After placing your book order, you will receive an email to notify you when your order is fulfilled (within 24 hours), after that it takes 3-5 days for domestic deliveries and 10-12 days for international deliveries. Occasionally these times are delayed, due to unknown causes. If you have any concerns, please email sales@gentleparentingmemes.com. Tracking bumps the shipping cost up considerably and also delays the delivery time slightly, so I've only offered this option for larger orders (5 or more books), for the buyers peace of mind (available at checkout). If you'd like to request tracking on your order of less than 5 books, please email sales@gentleparentingmemes.com so this can be arranged. © 2017, Gentle Parenting Memes. All Rights Reserved.